Review: another winner for Geek Girl! 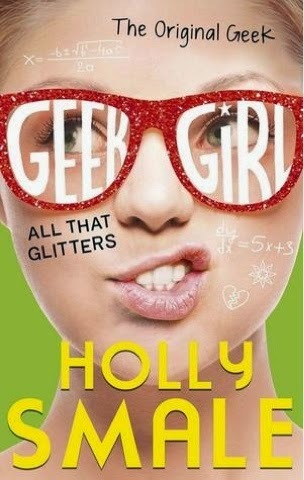 This particular Geek Girl books was an interesting one because Harriet, amazing Harriet, is now without Nat and she is at sixth form, a major transition for her. With her tendencies, how will she handle it all? Obviously the answer is with a great deal of mishaps which provide endless humour for us the reader. The ups and downs of Harriet's life never end and so there are many laugh out loud moments in this book. Of course all is not looking well for Harriet Manners right up until the very last moment but she uses her winning personality and her fabulous friends to get her through it in the end! There are some interesting model shoots in this particular novel. We have flashbacks to previous shoots with nick aka Lion Boy but also an amazing shoot out in Mororco which involves step mummy Annabel representing Harriet and making sure everything runs smoothly. Despite these shoots we really don't see enough of Wilbur in this novel, Harriet gets various texts from him which remind us of just how funny he is as a character which almost makes it worse that he really isn't in this novel-I miss him. Harriet's dad is just as funny as ever and you really do find yourself scratching your head as to how he manages to get on alone in the world. Nat really comes into her own in this novel and we also see another side to Alexa and her little gang which was really interesting! But again, nick is missing. If you've read the other Geek Girl books then you'll know why but I felt really sad that he wasn't in this novel. There are some really bittersweet flashbacks throughout the book to when he and Harriet had done photo shoots together in the past and the end of the novel leaves it very open ended as to what is goingtno happen with Nick but hurrah there MAY be another potential love interest on the scene and so I can't wait for the next installment in the series to find out how all that pans out! No spoilers here, I promise! Overall I loved this dose of Harriet Manners, it's another fab read and one I am sure you will absolutely storm through. There are laughs, there are some really aww moments and some moments where you think that Harriet might not actually manage to pull through this time but overall it is a real feel-good fun read. If you haven't read the other books in this fab series then go and do that now and then get your reading goggles around this one as soon as possible-you won't be disappointed! What made me start blogging?